This weekend, with temperatures down between -11 and -19 Celsius, most people remained indoors. Yet, over a hundred of us from all over Central Illinois were camping at Camp Illinek. 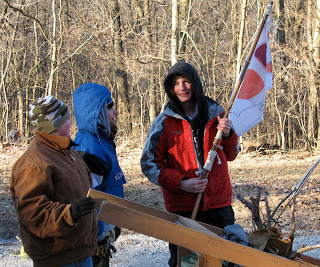 The boys had a lot of fun trying to demonstrate their skills and solve various problems at stations around the camp. From troop three we had four boys participating: Jack, Johnny, Matt, and Mike. Here are some photographs of the guys enjoying the day. The key to having fun and staying comfortable in such temperatures is to dress appropriately. If you're wearing enough warm clothing and wearing it correctly you can feel quite good in such temperatures. Sleeping in such weather is another matters. It's not as easy to stay comfortable when you're not moving. The first image shows Jack mashing up the pancake the boys prepared at one station. They started a fire with sparks from a flint and quickly had a little flame they fed with tiny sticks until the fire was large enough to cook a pancake. The second images shows all four boys making it across an imaginary river using a couple boards and some logs. The third image shows Matt, Johnny, and Mike as they start to take down a little tower they built to keep themselves above the ground where an imaginary flood was threatening. The fourth image shows Jack guiding Johnny through a maze. Johnny is blindfolded, and must rely on Jack's oral commands. The fifth image shows Mike starting out across a rope bridge the boys made. My Great-Grandfather Jack Turner was a gold miner in the Klondike. He also served on the Yukon Executive Council or Legislative Council for a few years before it was temporarily disbanded by Ottawa in 1919. So, this weekend I went out to a local campground here in Springfield where scores of boy scouts were enjoying the Klondike Derby. Here are some photographs I took. 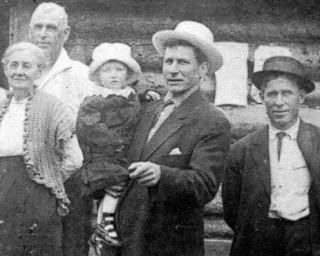 Well, the first photograph is from the Yukon Territory, and you can see my Grandma Nel in the arms of her father, my great-grandfather Jack Turner. That's the summer. In the winter in the Klondike the temperatures bounce around between -40 Celsius and -10 Celsius. There is a photograph of myself studying for the course I teach on social welfare policy. This was on Friday evening when it was still pretty warm, about -7 Celsius. The other picture of me shows me early on Saturday morning, when it was about -18 Celsius. If you dress warmly (as I did), it's not a problem when the temperatures get down to such low temperatures, but it can be difficult to sleep in a tent. One problem is that the condensation from one's breath can form an ice crust on whatever blanket one has over one's face, and if one doesn't use a blanket or mask over one's face, then one's skin (nose and cheeks) get cold. Another problem is that water bottles freeze up solid, so it can be difficult to get a drink. Anyway, that photo of me on Saturday morning shows that my skin is rather pink. It becomes so in cold, as blood seems to rush to the skin surface, perhaps to bring warmth to the skin cells and to prevent them from being destroyed by feezing. 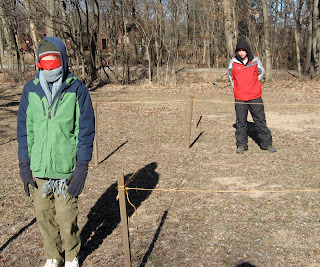 The fourth image shows Matt, Mike, and Jack, three boy scouts who were camping for the Klondike derby. I was cleaning up my office area at home, which had been threatened by a recent flood here in the basement, and I found a folder with some old scraps of art and clippings of interesting designs. This was stuff I made or collected between 1974 and 1989. The first image is from 1974 (or 1973? ), and I drew it when I was six years old. It's not really a doodle. 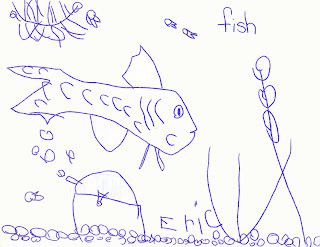 It's a fairly serious drawing of a fish in an aquarium. 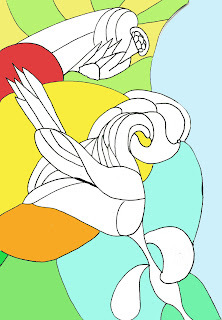 The second image is an abstract doodle from 1981. I liked placing contrasting shadings and shapes around in a scene. There are two doodles I did in 1987 and 1988. 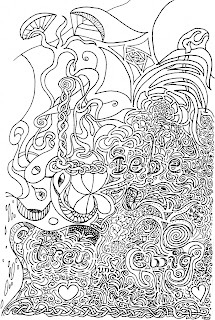 I remember drawing the one about love being true and eternal when I was in East Germany back in the summer of 1988. 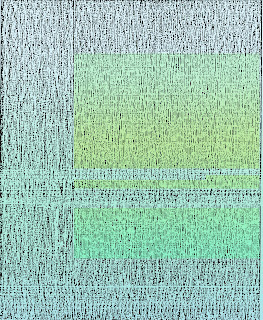 The last image is an abstract I made on a Macintosh Plus back in 1986. I've added the color now. I always intended it to have color, but back when I made it you really couldn't do much color on a Macintosh Plus. How many of each Religion? I was recently looking for some stuff at the Census Bureau when the Top 5 Data Links there caught my attention in the Statistical Abstract. Table 74, Self-Described Religious Identification of Adult Population: 1990 and 2001, was the fifth most popular data link. You can examine the table in PDF if you like. How many Baha'is did the survey find? Well, in 1990 the survey estimated 28,000 Adult Baha'is, and in 2001 that figure was up to 84,000. The figure of 84,000 sounds more plausible than the 28,000 figure for 1990. I've worked in organizing voting meetings for my area of Baha'is, so I was able to examine the list of all enrolled Baha'is in my area of Illinois. Knowing that the voting areas have approximately the same number of Baha'is in them, and knowing how many voting areas there are, allowed me to estimate how many Baha'is were on the rolls (and how many of those were active). I also reached a conclusion that there would be slightly over 100,000 Baha'is, of whom the majority (about four-fifths) were adults, and so the 84,000 figure for adult Baha'is fits with that. But, I don't think the Baha'i community has grown dramatically between 1990 and 2001. So, this calls into doubt all the figures from this survey. Of course in a study like this the measurement errors are much higher for the little groups, so the confidence interval for a group like the Baha'is who make up 0.05% of the adult population must be fairly large relative to the bigger denominations. You can read more about the study at this website about the ARIS study. The big groups are Catholics with about 51 million adult believers in 2001, the Baptists with 34 million adults, and the Methodists with 14 million adults. About 160 million adults, about 77% of American adults, self-identified as Christian. About 1.4% of adults were self-identifying as Jewish, and about half of one percent self-identified as Muslim. What about Atheists and agnostics? If you combine those two and add "humanist" and "secular" and "no religion" you get about 29.5 million, or slightly over 14% of American adults. The number in that category more than doubled between 1990 and 2001. I wish the Baha'is had as many believers as the other minority religions like the Jewish, Muslim, or Buddhists. You can get some really interesting dynamics and activities in a community of over a million believers. You just can't get the same style of community life in a national community with maybe 60,000 active believers and another 50,000 fairly inactive ones. Hey, reader, have you examined the Baha'i Faith? Despite it's faults (the same sort of faults you'll find in any organized religion or association of humans) I'm a believer and quite satisfied with identification with it. Maybe you would like to know more? I've been reading Shopping for God by James B. Twitchell over the past few weeks. It's sort of a bedside book I've been enjoying. As many people know, the Southern Baptists, the Church of God in Christ, and the Mormons have been enjoying some growth over the past years, while the United Methodists, Presbyterians, and Episcopals have been losing members. A few points stick in my mind. One, the most powerful way to get people to make an initial visit to a church is to use a word-of-mouth invitation. Second, much of the long-term trend in growth among evangelicals and decline among mainline Protestants comes from the different birth rates. The mainline Protestants have been having fewer children. I wonder if this also would partly explain the 30-year trend toward conservative ideology in the United States. Providing members opportunities to bond together is another key attribute that determines whether people come and stay, or drift away. The tone of the book is not too flippant. It's not especially respectful either, but I wasn't offended, and I think most liberally-minded religous folks who are interested in social science or marketing would enjoy the book. As a Baha'i, I found the book had some interesting ideas about marketing a religion that seem to be partly understood by the elected leadership in the Baha'i Faith. The current emphasis on Baha'is getting out and being friendly and caring with people around them is certain a good step, both in terms of ethics and in term of marketing. We need to work more on giving people a good experience when they start to participate in the Baha'i community. I think we probably drive people away sometimes with the quality of our community life. But, there are bright spots, and in the long run, I think Baha'u'llah gave humanity some suggestions that will lead to very satisfying communities of Faith, whether those communities call themselves "Baha'i" or are merely influenced by the Word Baha'u'llah revealed. Lately I've noticed letters to the editors of newspapers and blog essays where people complain that the tax system in the United States is really set up to soak the rich. People complain that liberals like John Edwards are lying when they say the wealthy take advantage of the tax system. In fact, the conservative say, the wealthiest households in the United States pay most of the taxes, and the lowest half of the population pays very little in the way of taxes. First of all, if you accept (as I do) the proposition that the free market tends to exaggerate the rewards given to people near the top of reward distributions and tends to undervalue and underpay people near the bottom of reward distributions, then one sees a certain unfairness in the way people earn income. People near the top of the pay scale (the rich) tend to be overpaid. They get more than they need, and they usually get a bit more than they deserve. Partly as a means to rectifying this injustice, taxes and government policies can take some money from the wealthy and redistribute it to people who are less wealthy. The poorest people, who can afford very little, can pay very low taxes, or even no taxes at all, while the wealthiest people, who can afford to part with some of their money, can pay higher taxes, and give up a greater share of their wealth. This can be done with a progressive income tax, and it can be done through policies that give more to the poor and give less to the wealthy. If one accepts this, then there is no moral objection to conditions such as having a group of 5% of the taxpayers, who might take a quarter of the national income, pay more than a quarter of the national taxes. And, if the poorest half of the nation's taxpayers take in 5% of the national income, then they may pay less than 5% of the nation's taxes. One mistake conservatives make when they talk about taxes is to only count certain types of taxes. Most people, even poor people, pay sales taxes. Many pay property taxes. Many pay registration fees and processing fees and court costs and fines and other forms of revenue to the public purse. People tend to pay taxes to local, state, and federal governments. And, along with the income tax, there are also taxes for social security, workers compensation insurance, and these sorts of things that are taxes on earnings that supposedly differ from the federal income tax. When I've read conservative letters or essays about taxes, they never explain exactly what taxes they are describing, and I have yet to see good references to where they find their data. I thought I should do my part to investigate the matter of the federal income tax, and how much the wealthy actually pay, and how this compares to people at the middle class. In this blog entry I'm giving references to the documents I'm using, and I'm only talking about the federal income tax. I began my search at the Census Bureau. My first question was, "what share of aggregate income (all income received in the nation) do the wealthy actually take?" I found the answer when I examined table 675 from the Census Bureau's publication, the Share of Aggregate Income Received by Each Fifth and the Top 5 Percent of Households: 1967 to 2005. It’s available at this page. According to Census Bureau, the top 5% of American households received about 22.1% of aggregate income in 2000, and about 22.2% of aggregate income in 2005. In 1993, the year Clinton was inaugurated, the wealthiest 5% received 21.0% of aggregate income. In 1981, the year Reagan was inaugurated, the wealthiest 5% received 16.5% of aggregate income. So, the wealthiest have seen their incomes rise from 16.5% of our nation's aggregate income to 21% during the Republican era of the 1980s, then rise one percentage point to 22% by the time Bush was given power by the Republican Supreme Court (Constitutionally, we should have waited for the Republican Senate and House to give him power), and since Bush has been in power the top 5% first lost their percentage and more recently have gained their percentage back to about where it was in 2001. That's the story the numbers tell. What about the working class, the poor, and the lower middle class? The bottom 40% earned 14.2% of income when Reagan became president (in 1981), they earned 12.6% when Clinton became president (in 1993), and they earned 12.2% when Bush became president (in 2001). In 2005, the most recent year for which there is information, the bottom 40% of households earned 12% of aggregate income. The working class and poor are earning a smaller fraction of national aggregate income, but the trend has been slowing down since the 1990s. So, it appears that the 1980s and early 1990s were a time of growing inequality, while inequality did not grow much in the Clinton era of the 1990s or in the Bush era of the past six years. At least, this is the story one can take from the Census Bureau report, and this is true of you only look at inequality by comparing the top 5% and the bottom 40%. Is that a good way to compare trends and learn about inequality? It's good, but it's also fallible, and it's wise to use multiple fallible indicators to get teh whole picture. This particular indicators is a reasonable type of comparison, and when you use this comparison, the inequality trend is bad, but nothing is changing rapidly or radically in recent years. Some conservatives, such as a guy from Naperville, Illinois, named Tom Rand (who wrote a letter to the Illinois Times, a newspaper here in Springfield, where I live) claim that the tax burden for the wealthiest Americans (as a percentage of all taxes paid) has increased relative to their (trivial) increase in earnings (“earnings” as a percent of aggregate income). In other words, if you know that the wealthiest top 5% of the nation has been earning 21% to 22% of all income, and this hasn't changed much at all in the past six years, but you know that the same wealthiest 5% has been paying a higher percentage of the total national income tax, then you can make a claim that the wealthy are paying a greater share of national taxes while their share of national income has been stagnant. Their taxes are going up relative to their incomes at a rate that is faster than the increase for everyone who isn't wealthy. If this is true, then it appears that the wealthy aren't getting a great deal with the Bush tax system, and in fact the economy and taxes we have had since the Bush administration tax cuts of 2001 tend to favor people in the bottom 95%. That's a story based on this one chart from the Census Bureau, but let's consult another fallible indicators of the situation. Let's see what data we may find at the IRS. If one goes to the www.IRS.gov website it’s fairly easy to find a detailed analysis of the 2005 taxes paid by various income groups. I found most of what I needed in: this pdf Fall 2007 report on the 2005 taxes (collected in 2006). The best page is page 40 (of 64), where you find Table 2. All Returns: Tax Liability, Tax Credits, and Tax Payments by Size of Adjusted Income, Tax Year 2005. It's also important to look at page 16, at Table 1. All Returns: Sources of Income, Adjustments, Deductions, and Exemptions, by Size of Adjusted Gross Income, Tax Year 2005. Looking at the IRS data I wanted to see where my household fits in the big picture. How are we doing, relative to others in the economy, and how does our income and tax responsibility compare with that of the wealthy? It turns out I'm in the middle of the middle class. My wife and I file jointly, and our gross income before adjustments is usually in the bracket between $40,000 and $50,000, although some years (when I work through the summers or get a nice grant) we have gross incomes between $50,000 and $75,000 (actually, not much over the lower threshold of that bracket). Our incomes are close to the state median income in Illinois for a male full-time year-round worker. Also, with the 2006 median U.S. household income of $48,201, our income clearly represents the middle class. Anyone with an income in the $40 thousands or $50 thousands is middle class (at least in terms of income). My labor effort is also close to the average for American full-time year-round workers, as I work about 1900 hours per year for my paying job and my wife works about 250 hours per year in her paying job (we have two school-aged children, and my wife's work as a mother and homemaker is ignored in all these official statistics, although tax cuts we get for having children considerably reduces our federal income tax responsibility). There were in fact 26.8 million returns by persons or households earning, like us, between $40 thousand and $75 thousand. That's almost 9% of our total national population, right in the middle of the middle class. In terms of all the tax returns that were filed, that's about 32% that fall between $40K and $75K. Those 26.8 million tax returns filed with the IRS showed a total income of $1.60 trillion, and these middle class filers paid a total of $179 billion in federal income tax. You can sum up and divde the figures to arrive at a picture of an average middle-of-the-middle-class household earning $55,000 per year, and paying about $6,700 in federal income taxes. That's about 12.07% of adjusted gross income paid to the IRS by people in this range. Let's compare this typical and middle-class group to the wealthy. If you add up all the incomes of the 3.6 million filed tax returns in which individuals or households reported over $200 thousand income, you get a figure of 2.17 trillion, and these tax returns came with payments of a total of $467.8 billion in taxes. By the way, the IRS reported total adjusted gross income for all returns at $7.422 trillion, and total tax returns of $1.084 trillion. That means the people earning over $200,000 earned about 29.2% of all income reported to the IRS and paid about 44.9% of all taxes (much higher than the Census Bureau's report!). That works out to an average of $608 thousand in annual income for an average affluent person in the top 4% of the American income distribution. But what do these 3.6 million taxpayers pay in federal income taxes? In total, they paid a total of $468 billion. That works out to an average of $131 thousand per tax return. In other words, the average middle class person is getting about 9% of what an average affluent person is getting, but is paying in federal income taxes only about 5% of what an affluent person pays. To put it another way, a typical person in the middle class is paying about 12% of income in federal income tax, while a typical affluent person is paying just under 22%. This affluent top 4% that gets over $200 thousand per year is paying 45% of all federal income taxes paid to our government, while the middle 32% of all taxpayers (those earning between $40 thousand and $75 thousand) are paying only about 17% of all taxes. I mentioned above that the average affluent person is paying under 22% of income in federal taxes. This is a slightly misleading. The 2.7 million returns showing incomes between $200 thousand and $500 thousand pay on average 19.35%, while the rest of the affluent making over $500 thousand per year tend to pay 22.6% up to 23.7% (the average for persons getting between 2 and 5 million). So, really, the super-rich are paying between a fifth to a quarter of their incomes in federal income tax, while the merely affluent, who earn between $200 thousand and half-a-million are paying, on average, slightly less than a fifth of their incomes in federal income taxes. Personally, I'm not alarmed by this in either direction. I don't think the rich are getting a raw deal, nor do I think they're getting a grossly unfair advantage. I do think the rich are paying less than their fair share as it is, but not a dramatically unfair share. I wouldn't mind if a household earning over $1 million paid 30% or 35% of their income in federal income taxes (instead of the 23.7% to 22.1% that such wealthy people currently pay). As for the middle class, I think paying about 12% of one's income to the federal government through federal income taxes is about right for the middle third of the income earners in a nation. Really, anywhere between 10% and 15% seems fair to me for the middle group. If the middle class was paying 10% instead of 12% of their income to the federal government, the federal government would lose about 19 billion in federal income tax revenue (and put that much money into the hands of the 32% of the taxpayers in the middle incomes). To balance the revenue loss from this massive tax cut for the middle class we could increases taxes on the wealthy. If we increased taxes on the wealthiest 4% so they, on average, paid 28% of their incomes in federal income taxes instead of what they pay now (about 22%), it appears to me, from the IRS data, that the federal government would gain about 140 billion from the tax increase. This 140 billion increase makes up for the 19 billion loss from the middle-class tax cut, and would give our government about $121 billion more revenue. I'd like to see such additional revenue used to balance the budget and pay down the national debt. More public money should be spent on medical research, alternative energy research, and pure science research. I think we also need a more generous government program to make higher education generally more affordable. Nationalized health care would be a great thing, and we could scrap Medicaid and Medicare, replacing those with a new National Health Insurance. A gain of $121 billion in government revenue, combined with sharp decreases in military spending (down to 3% or 2% of current GDP, as opposed to the 4% to 4.5% of GDP our nation currently allocates to defense and defense-related expenses), really could make a national health insurance scheme quite feasible, and if the government paid for billions of dollars in medical and energy research, and then let American taxpayers enjoy the resulting benefits without paying royalties to private companies or universities who used the money to do the research, that would also give us a more efficient economy and health care system. I don't think raising taxes for people earning over $200 thousand per year up to a point where they pay, on average, 28% of their income in federal income taxes rather than 20% or 23.5% (as they do now, on average) is "class warfare" or a "soak the rich" scheme. I also don't buy the conservative argument that this would ruin incentives for good corporate executives and inventors and risk-taking investors. Would the highest paid executives make more stupid decisions or become less creative because 28% of their compensation and reward was going to the federal government rather than 22%? I don't think the wealthiest and most talented people would start goofing off and ruining their companies. Maybe if the federal income taxes were up at 50% or 60% rather than the 27% to 35% that I think fair, then rich people would flee or become demoralized. But an increase to 28% isn't going to encourage wealthy fair-weather-patriots to give up their American citizenship and move to tax havens and take up citizenship in the Cayman Islands.